It is definitely harder to write about something that you don’t have strong feelings about. If you either love or hate a fragrance it seems that the words just flow. As the following scents will be put to rest in my samples box because they don’t invoke love or hate, I thought I would try something different and so some very short reviews. I’m not sure how helpful they may be, but let’s give it a shot! WHAT I SMELL: Ineke’s Hothouse Flower opens with a burst gardenia and green tea. The fragrance then blooms into a warmer gardenia with hints of fig. 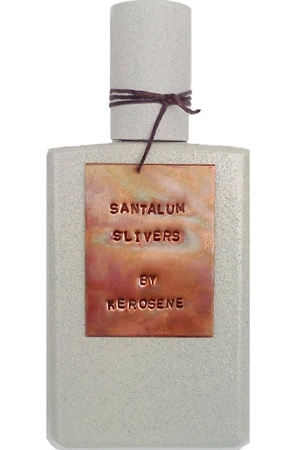 WHAT I SMELL: Kerosene’s Santalum Slivers opens with sweet juicy orange, like orange concentrate orange juice. It then turns to more of an orange/lemon cleaner like composite. 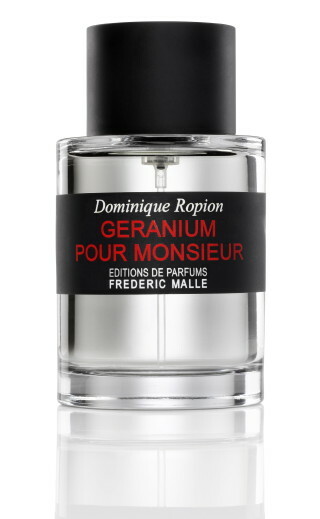 WHAT I SMELL: Frederic Malle’s Geranium Pour Monsieur opens with a blast of camphoric mint…strong, strong mint. It’s very powerful and overwhelming at first, almost toxic in its volume. When it dies down it becomes a bit spicy and warm. It’s a familiar scent that seems powered through chemicals. BOTTOM LINE: All of these are semi-interesting compositions that just don’t work for me. Hothouse Flower is not for men and Geranium Pour Monsieur would not work for most women. Santalum Slivers is nice, but there is something there that leaves me a little cold, but I do love Kerosene’s artful bottles! Categories: Frederic Malle, Ineke, Kerosene | Tags: 3 bones, fragrance, Frederic Malle, Geranium Pour Monsieur, Hothouse Flower, Ineke, Kerosene, parfum, review, Santalum Slivers | Permalink. Thanks for sharing. It’s sometimes good to write about something you have no feelings for, though I know it’s harder to write then. Good job. Never tried any of those 3, don’t know if I will try them. If you didn’t check them out, you probably would not be missing much, but of course, some like Geranium Pour Monsieur are big sellers so somebody out there likes it!! Yes, I didn’t check them out but I think not much is missed by me. I know that many like FM fragrances. Geranium Pour Monsieur was at split few weeks ago at Polish Perfume Splits Board. The only one I’ve tried is Hothouse Flower which I do like. It’s not as big a most big white florals are and I do understand the granny vibe you get from it. You’re right, it wouldn’t be my choice for a man either. I like some of the Kerosene scents but haven’t smelled Santalum Slivers. It’s sounds too orangey for me. Agreed that Hothouse is not over the top… as for Kerosene, I have heard many really great things about his perfumes, but this is the 2nd one I have tested (Copper Skies the other) and I see what he is attempting, but they are a bit too rough around the edges for my liking. I like Hothouse Flower, grandmotherly or not 😉 and will probably get a bottle for the next Spring. I haven’t tried any of Kerosene’s perfumes (for some reason I’m not attracted to the brand). Geranium Pour Monsieur… don’t remember, I probably missed it when I tried the line. I’m glad you like Hothouse Flower, it is a nice perfume and I can live with wearing feminine scents, but this one just crosses a line for me. For some reason, Ineke’s fragrances don’t jive with my own aesthetic — and that proved true with Hothouse Flower, which I had high hopes for, as in general I’m a white-floral lover. I do admire Ineke’s customer service and attention to detail, though, and her perfume bottles are works of art. What a releif, finally something I don’t need to try ;-). Of course I will if it comes into my hands accidentaly ;-). Don’t go by my word. Lots of people love these, maybe you will too!!! Some things should be missed so we can discover them later and unexpected. Life is so much interesting then.